Hi, I’m Megan and I blog over at A Blessed Nest, where I write about marriage, motherhood & making your house a home. 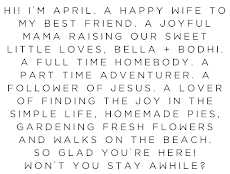 I am married to my best friend and better half and we have a 13 month old daughter, Olivia Bea. April asked me to share on the topic New Mama Must Haves and I chose a few items from 5 different categories to touch on! In addition to all the obvious things you’ll want to have on hand as a new mom – diapers, clothing, pacifiers, a carseat & stroller, etc., below I’m sharing a few of the New Mama Must Haves that I found to be extremely useful in the first weeks and months of Olivia’s life. Many are items that you may not think about but all have been valuable in one way or another. Calendula Cream [by California Baby] // This is my #1 product recommendation for any new mom. Calendula cream works miracles on any and every skin issue your baby may face – rashes, dryness, eczema, etc. Plus it smells amazing. We have been using it on Olivia since the day she was born and I will never buy another skin cream again! It was especially helpful through her first winter when her cheeks were very chapped. I would apply it before bed and she would wake up with perfectly soft skin the next morning. BONUS: A small container lasts 6+ months because you need very little for it be effective. Baby [Countertop] Tub // Even though we have a full sized bathtub, I still use our countertop tub to bathe Olivia and she is over a year old! It is so great not having to bend down to bathe her and strain my back plus it is the perfect size to fill with water without feeling like I am wasting 10 gallons for a 10 minute bath. BONUS: Ours came with a baby sling that we used when she was a newborn and it can be removed as your baby grows! Oversized High Quality Hooded Towel // Many of the towels you find in the baby section in stores are very thin and very small. Even more expensive towels are often rather small. My mom gave us a big children’s size hooded towel that is warm and cozy and big enough with room to spare to wrap Olivia up after her baths. We also bought a 2 pack of Circo hooded towels and within a month, they were so worn out I just threw them away. Invest in a high quality hooded towel, it is totally worth it. BONUS: By buying a large size from the beginning, you will be able to use it all through childhood! Aden & Anais Burpy Bibs // I have such a deep love for all A&A baby products, but especially their Burpy Bibs. Not only are they are great for bottle feedings and food once your baby starts solids, but they are oversized and contoured so you are able to use them as a burp cloth after feedings. BONUS: They come in the softest muslin & bamboo and get softer with every wash! High Quality Bottles [One brand] // During my pregnancy, I had such a difficult time deciding on the type of bottle I would use once I established a good breastfeeding routine. I went back and forth a million times when I registered. What I learned? Choosing one and sticking with it was the best option for us. I recommend finding a bottle that you really like and start there. Don’t buy 10 types of bottles and then try to figure out what your baby will use. Start with one and if your baby absolutely hates it, try a different one. There is a lot of hype about which bottles are best, which are the most natural, etc. but chances are, your baby won’t be picky. All they really care about? What's inside. I worried that Olivia wouldn’t like the kind we chose and she ended up loving them! Sure, I would stand behind the brand 100%, but I think she took so well to them because she didn’t have a choice. And based on our experience with her, I will hands down buy Dr. Brown’s bottles in the future for every baby. She didn’t deal with any colic or reflux, but I just love their bottles! BONUS: You’ll save money when you just choose ONE bottle type/brand to invest in, versus a bunch of different ones! Aquaphor // Forget all the fancy diaper creams, the best and most effective product? Aquaphor. We have been using it on Olivia since birth and she has rarely had diaper rash. When her diaper rash was mild, Aquaphor cleared it up right away. I have talked to other moms whose babies struggled with severe diaper rash and they swear by Aquaphor just like we do! BONUS: A good-sized container will last for months! Bassinet or Crib Mattress Pads  + Bassinet or Crib Sheets // We were blessed to receive a beautiful bassinet as a gift for Olivia and used that for the first few months of her life before transitioning her to the crib. Regardless of where your baby will be sleeping when you bring them home, I recommend buying two sets of bassinet/crib mattress pads and two sets of sheets. Layer them: mattress pad, sheet, mattress pad, sheet. If there is ever a need to change the sheet (which there will be! ), all you have to do is take off the top two layers and you’re set for baby to go back to bed. BONUS: Saves time AND stress, especially at 1 in the morning. Video monitor // Having a video monitor (instead of just a sound monitor) brought us both such peace of mind when we transitioned Olivia out of our bedroom into her nursery. They can be a bit more pricey but we purchased ours with coupons after receiving gift cards from showers and we are so glad we did. It is also helpful during naps if Olivia is having a hard time getting herself down and instead of having to go in to check on her, I can just sneak a peek on the monitor. Going into my pregnancy, I thought a video monitor was too expensive and an unnecessary luxury but over the past 13 months, I’ve found it has been an excellent investment. BONUS: I get to wake up to the sound of Olivia talking to herself and her stuffed animals in the mornings on the monitor. Heart melting. Halo Sleep Sacks // There are a few different styles and brands of sleep sacks but our favorites have been the Halo brand. We used the SleepSack Swaddle for the first few months and then once Olivia hit 6 months, we transitioned to the traditional SleepSack. I loved how comfortable they seem, how well they hold up in the wash, how breathable they are, and of course how much Olivia likes them. Having an extra layer of protection and warmth for sleeping that was equally safe was so valuable and they are certainly the only brand I will ever use. BONUS: They come in some of the most fun patterns and have a ton of gender-neutral options so you can use them for years and years of your future babies! Boogie Wipes // These are awesome. If you’ve experienced your baby’s first cold, you’ve probably relied on Boogie Wipes to clean their nose 849301 times a day. If you haven’t? Well, you will. They are so much better to use than Kleenex because they are moist with Normal Saline and they come in a few different scents. I buy the unscented for Olivia but grape is a very popular one for most moms I’ve talked with. They are handy, a great size, and a must have in every nursery! BONUS: They make travel packs that are the perfect size to throw in a diaper bag. Nose Freida // If you haven’t heard of this, you will. And if you haven’t purchased it, you should. Hands down, this is the most incredible little gadget ever. Say goodbye to the boring and inefficient bulb syringe & say hello to the new snotsucker in town! Yes, the Nose Freida is made for clearing out your babe’s tiny nostrils and it does such a great job. It is quick, painless and efficient. And when it comes to helping your babe breathe better, this is your number one tool! BONUS: For some odd reason, you feel super futuristic using it. Or at least, I do. Quick-read Digital thermometer // There are so many thermometers on the market: pacifier thermometers, scan (temporal) thermometers, travel thermometers, extra large thermometers, but my go to? A basic, quick-read digital thermometer that you will be mainly be using for axillary temperatures. I also think having a high quality rectal thermometer on hand is helpful if your baby gets super sick and the pediatrician needs a very accurate temperature (for those of you who aren’t in the medical field, rectal is always the most accurate). But on a regular basis, whether a cold, flu, or just every day teething, a quick read digital thermometer is going to help you discern what action you should take next. BONUS: You can find a great one that will last a long time at a low price just about everywhere. Brica Baby-in-Sight mirror // This has given me so much peace of mind always being able to see Olivia in the car. It is a mirror which you attach to the headrest above the seat in which your carseat base is and it allows you to always see your baby by looking in your rearview mirror. Olivia loves her carseat and actually claps when we put her in it (what? ), but it is still so helpful to see her and know that she is comfortable. If she needs something, I am able to figure out what it is without having to get out of the car and look. BONUS: When your baby falls asleep in their carseat, you can peek on them. There are few things more beautiful than watching your baby sleep. 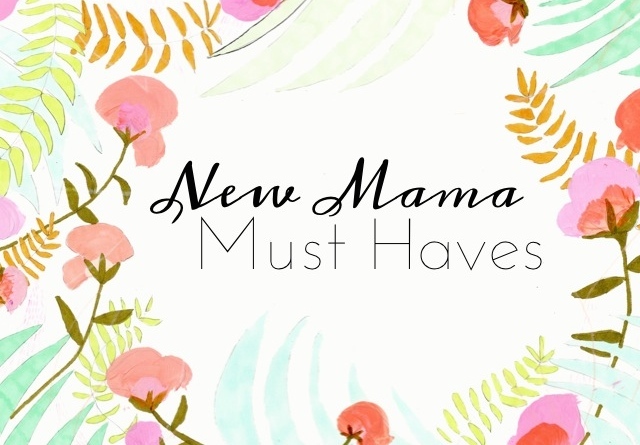 These are just a few of the main New Mama Must Haves that I feel are worth investing in. We have found all of them to be well worth it -- easy to use, effective and beneficial in more ways than one. The biggest thing I’ve learned is to keep it simple. A baby’s needs are basic and the goal of the products you purchase is to make life easier on the parent and better for the baby, whether physically, safety-wise, or overall well-being. I hope this has been helpful for every Mama reading. Leiaroux: Shop Feature + a Giveaway!